PG-PS 10S (peptidoglycan-polysaccharide polymer) administration induces a biphasic inflammatory response in rats, which includes an acute and/or chronic inflammatory phase. As such it provides a valuable model for assessment of the efficacy of therapeutic and prophylactic compounds on the acute and chronic inflammatory responses, especially for arthritis studies. A test compound in this model may show efficacy in acute or chronic (or both) phases of the inflammatory response. The efficacy pattern revealed may be a useful guide to the mechanism of action for the therapy and hence to the drug development program. PG-PS 10S is a glycoprotein polymer isolated and purified from the cell wall of Streptococcus pyogenes. Administration of PG-PS 10S in rat induces responses which are representative of naturally caused inflammatory disorders (chronic, erosive, remittent arthritis, granulomatous entercolitis (resembling Crohn’s disease), intestinal hemorrhage, carditis and vasculitis). It is used most frequently in the rat intra-articular injection model for arthritis. 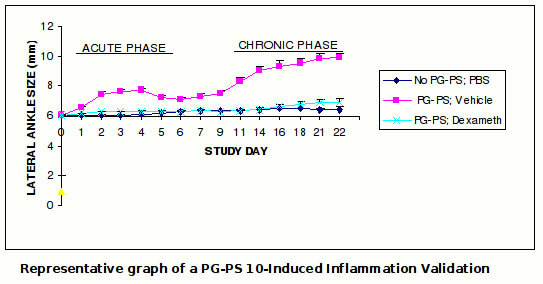 In our PG-PS 10S Rat Model an initial acute inflammatory response is seen within 3-6 days post-injection followed by a decline. A chronic response follows with a peak in measurements at approximately 12-16 days post-PG-PS 10S. The inflammatory response is quantitated by measurement of animal ankle widths by digital caliper. An initial acute inflammatory response is seen within 3-6 days post-injection followed by a decline. In this model an initial acute inflammatory response is seen within 3-6 days post-injection followed by a decline. A chronic response follows with a peak in measurements at approximately 12-16 days post-PG-PS 10S. The inflammatory response is quantitated by measurement of animal ankle widths by digital caliper. A typical inflammatory response graph is shown below with the anti-inflammatory dexamethasone serving as a positive therapeutic control. A chronic response follows with a peak in measurements at approximately 12-16 days post-PG-PS 10S.